Injuries seem to be on the rise here in Horsham PA along with the rising temperatures! At my work, Spring time injuries are running rampant. 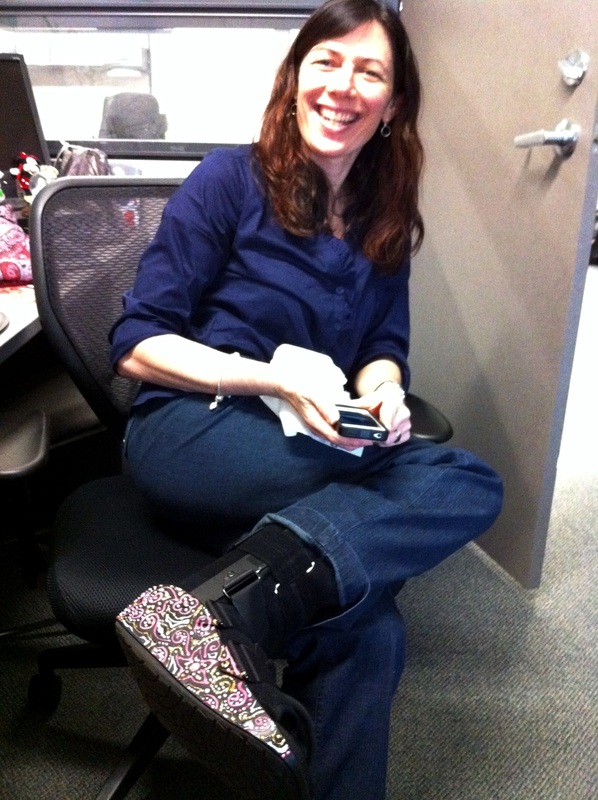 My co-worker’s wife broke her foot and now Jen, who sits in the office next to mine, has fractured her foot as well. She has been forced to wear a very bulky black boot for several weeks until her foot has healed and is strong enough to stand on its own. This heavy contraption is too large for her foot, so she must do the Frankenstein hobble to the kitchen, bathroom and such. Although entertaining, Jen needed a mood lifter from this drab black boot! 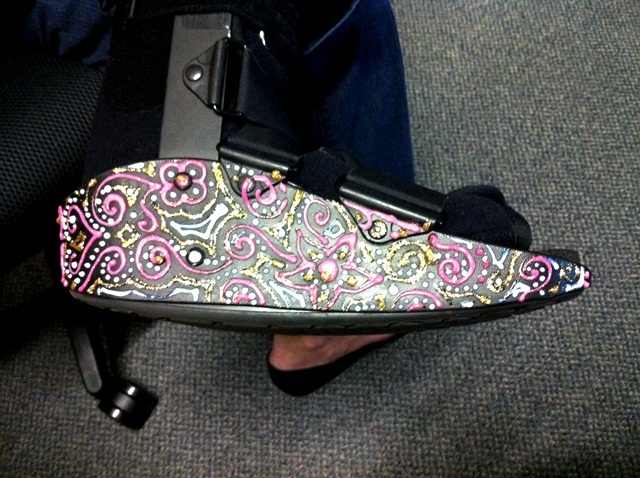 I decorated the boot’s profile in an intricate pattern with sparkly puffy paint, and Jen’s frown turned upside down. Amen! Hoping we had reached the limit of injuries for the month, our dear DBA Karen (Database Analyst) has returned from vacation in New Orleans with a broken hand. Cast art! First off, I’d like to say that I don’t blog, vlog, etc. I stumbled upon this website by “accident”. Yes, the injury thing seems to have become a Spring phenomenon especially in my neighborhood. I currently have 3 neighbors in boots and one that just had minor foot surgery. A gal I was dating broke her foot last week and I just got through having my foot incarcerated in a boot for about two weeks due to a sprain! Call it bad luck, karma, or the weird weather, I was puzzled by this, so I had to do some research…and came across this. I wish everyone who’s currently on the injured list this Spring a speedy recovery. Thanks for the comment. Fortunately there hasn’t been any more injuries… knock on wood!